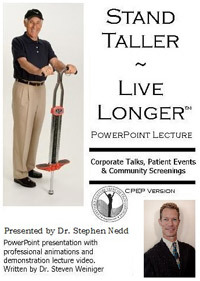 1st Tuesday of the Month, 7:00pm Presented by Dr. Stephen Nedd, Posture Expert. Do you want to be active in your 50’s? 60’s? How about your 80’s? Stand Taller ~ Live Longer is an anti-aging strategy which can truly make a difference not only in how your body moves today, but also how you’ll move 20, 30 and even 40 years from now. This lecture combines cutting-edge research and information on the importance of how posture and movement plays an integral role in your health and well-being. 3rd Tuesday of the Month, 7:00pm Presented by Dr. Stephen Nedd, who will lead an animal adjusting health lecture as a Certified Veterinary Chiropractitioner. Did you know that Dr. Stephen Nedd is certified in animal adjusting? Dr. Nedd has been treating animals for over 24 years. Come for an entertaining night to learn about animal adjusting. Dr. Nedd’s dogs, Happy and Undura, will make a cameo appearance and will eagerly allow Dr. Nedd to adjust them live! Learn if animal adjusting is right for your loved pet–bird, cat, dog, horse, or any animal with a spine. Animal adjusting is the practice of spinal manipulation or manual therapy for animals. Benefits include enhanced performance, decreased pain, restoration of motion and function, and improved quality of life. 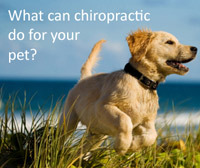 Dr. Nedd will cover the benefits of the gentle instrument adjusting technique called Veterinary Orthopedic Manipulation along with cold laser therapy for animals. He is available to see small animals at Day and Evening Pet Hospital and Pet Surgical Center in Palm Harbor as well as his office as long as the animal has been seen by a licensed veterinarian and the owner has signed the Animal Adjusting Veterinary Affiliation Form.